CBSE Patrachar Vidyalaya Shalimar Bagh Admission class 10th & 12th – COMPLETE YOUR SCHOOL EDUCATION COMFORTABLY WITH OUR HELP! CBSE Patrachar Vidyalaya Shalimar Bagh Admissions for class 10th & 12th for 2019-20 session for school fail students in class 9th or 11th who want to take direct admission in class 10th or 12th CBSE Board. 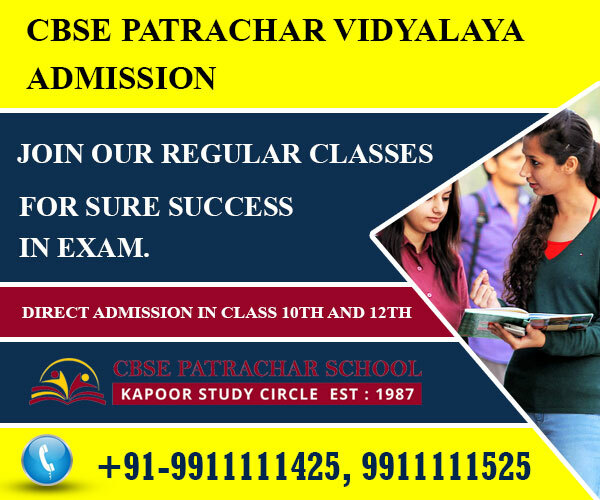 Contact US ;9911111425 , 9911111525 for admission form and other information for CBSE PATRACHAR VIDYALAYA SHALIMAR BAGH. call now last date soon. Patrachar Vidyalaya Admission is another way for Direct Admission in Class 10th or Class 12th CBSE Board. Here the school final exam unsuccessful students of class 9th or 11th can apply For Patrachar vidyalaya admission class 10th or class 12th. Patrachar vidyalaya also provides another chance to school Dropout students also. Patrachar Vidyalaya shalimar bagh offer Patrachar education via CBSE Board. Therefore Patrachar Vidyalaya shalimar Bagh offers CBSE Patrachar Courses called Patrachar Vidyalaya Admission or CBSE Patrachar Admission. Our Patrachar school offer all these courses. 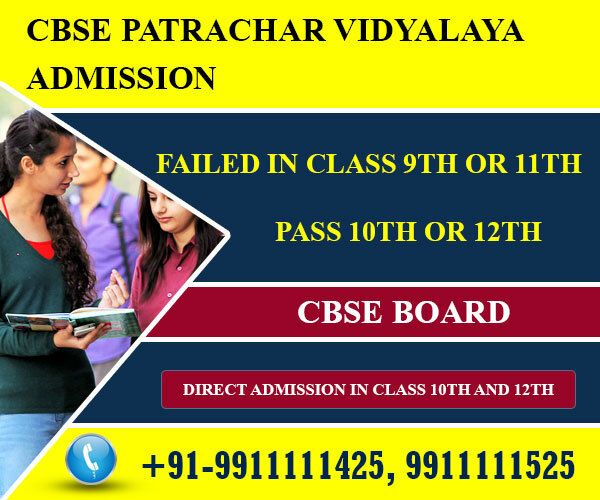 Patrachar Vidyalaya, CBSE Patrachar – Admission Eligibility for Class 10th. All the students male or female from the following categories are eligible for Admission in class 10th Patrachar vidyalaya. a) All students from regular schools Fail in 9th class school final exams. b) All students who Passed 8th class one year back and left the regular school. c) All students Fail in 10th class CBSE BOARD public exam IN 2019 or earlier. e) All male or female candidates who have attained the age of 14 years on 31/03/2019 this year. All of You can directly take admission in 10th class in CBSE Patrachar Vidyalaya and continue your studies through our guidance and help and surly pass with good marks if you join our regular school time classes! Patrachar Vidyalaya, CBSE Patrachar – Admission eligibility for class 12th. Similarly All the students in the following categories can apply for Admission in class 12th. a) All students unable to qualify the class 11th school final exams or fail in 11th class school exams. b) All students Passed 10th class from any recognized board one year before and left the school. How to take CBSE Patrachar , Patrachar vidyalaya Admission for class 10th & 12th For Patrachar Studies? CBSE PATRACHAR SCHOOL is an educational institution serving the student community for the many years. Over the last several years and more, thousands of dejected and frustrated students, who were denied the opportunity of Appearing board examination of class 10th or 12th got their chance once again with our help From Patrachar vidyalaya. CBSE Patrachar Vidyalaya, a Delhi Government Education Board, shows an alternative way for these unfortunate students – boys and girls. CBSE Patrachar Vidyalaya admission form 2019 are open for needy students. By admitting these students for sitting in CBSE 10th class (secondary grade) and 12th class (senior secondary) courses public examinations, These students are brought into regular schooling streamline by completing their studies with CBSE Patrachar Vidyalaya Shalimar Bagh and many more. They need not get disappointed over the denial of this opportunity in any other schools. By studying CBSE courses for 10th class and 12th class and passing, these students can continue their further studies. 10th class pass students can join 11th class in any school in India, 12th standard passed students can seek admission in colleges and universities, in India and abroad, for achieving graduation in any faculty of study. If they want, they can get suitable employments also. CBSE Patrachar Vidyalaya courses are made accessible to the fail and drop-out Students for admission in class 10th and 12th. With our help and guidance you can apply for admission in 10th class and 12th class. 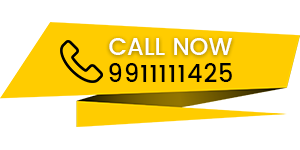 we help you in filling your admission form, completing the procedures and formalities of admission. Therefore you can get the complete information about the important documents required, your subjects selection for class 10th or 12th and the important dates of admission. In the study centers of CBSE PATRACHAR SCHOOL in Delhi at Rohini, Pitampura, Punjabi Bagh, Janak puri, south Delhi , 10th class and 12th class students get special coaching, in the prescribed CBSE syllabus and subjects. The teaching professionals use their vast experience in training thousands of similarly failed students. They understand the fear of these students. So they handle them carefully to train them well in failed-subjects individually and trained them to face toughest exams. With modern facilities and equipment, the special coaching and teaching methods consist of explaining each subject of CBSE syllabus and books, with previous question papers, mock-tests, easy-to-understand study-materials and guides for the subjects. When the students appear for CBSE 10th class and 12th class exams after this, Finally they find the question papers easier this time. Passing becomes a sure thing! Important Documents Required For admission in Patrachar Vidyalaya class 12th. b) Also the Voter I-Card showing the name of the candidate in legible form. also In case of Minor, the Voter I-Card of his/her parents is acceptable. g) Also Self attested Photocopy of Driving license in the name of candidate issued from Delhi Transport Authority is acceptable. h) Affidavit for residence proof in Delhi issued by SDM/lst Class Magistrate also acceptable. SUBJECTS LIST FOR PATRACHAR VIDYALAYA 12TH STUDENTS.